Being one of the lucky few to still get offers from Venetian and Palazzo I took advantage of my latest one for $300 free play, $75.00 food/bev credit and 4 nights at Palazzo and booked it for a girl's trip starting January 10th. I flew in a day earlier then my 2 girlfriend's because I was taking my friend Socalgirl who lives in Vegas out for her birthday on Monday. 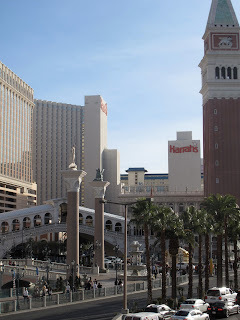 My Southwest flight from San Jose to Las Vegas was smooth, luggage came out quickly and using my gold grazie card for a free ride to Palazzo on the Executive shuttle was quick and easy since Palazzo is the second stop after Venetian. 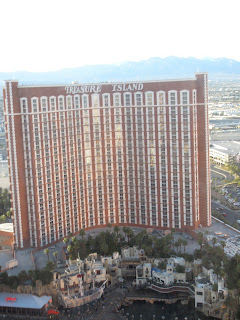 Check in at Palazzo was also smooth and I was in my suite with the usual view overlooking Treasure Island. I quickly unpacked and had a hour before Socalgirl picked me up for dinner so I was quite happy when the first slot I tried the $5 Wheel of Fortune pictured above gave me a spin on the 2nd push and I won $400. I then went to my favorite Wolf Run and had a couple nice hits on it including the one above. Socalgirl was on time as always and she drove us to Cosmopolitan for my first look at it in person and for us to meet another friend Doris who lives in Alaska and had arrived in Las Vegas on Saturday. 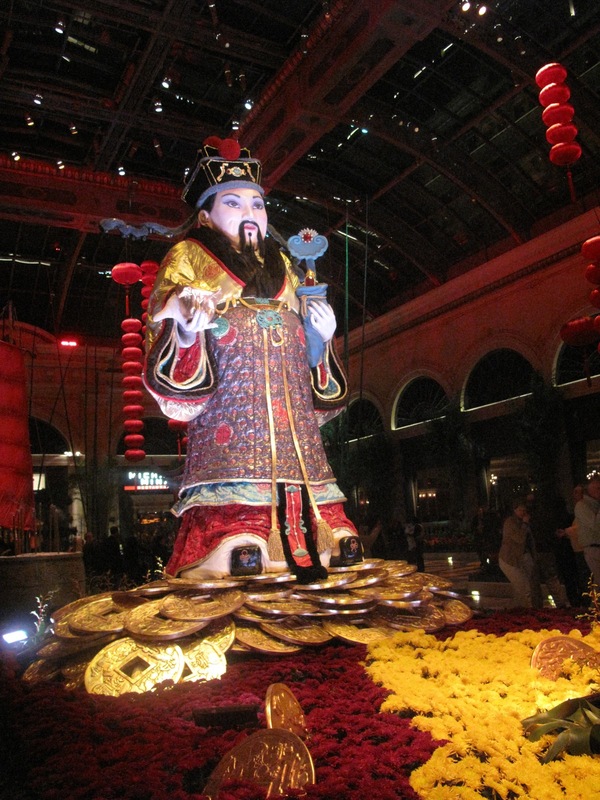 While walking into the casino we passed this display of Buddha's that had coins on it and made our own small offering. By now most people have seen plenty of photos of Cosmopolitan and in person the place lives up to the glitz. Our first stop was the player's card desk where I learned that even though I had signed up on line that wasn't working so I had to do it again. I took that opportunity to let them know I was a Gold Grazie member and the next day would be Platinum level with M-Life's debut, and asked was it possible to get upgraded to Identity Gold level as my friend Socalgirl had already been upgraded using her Gold Grazie card. Their answer was I had to speak to a host, but after about 10 minutes or so they still couldn't locate a host that had time to come down to speak to me, so we made arrangements for them to call me when they had one and I went off to gamble. I would like to show you a photo of the big win I had at Cosmopolitan but unfortunately all I did was lose, in fact I lost all the winnings I had made earlier at Palazzo. The above photo is an example of one of their gaming cabanas that are located in areas of the casino. After I felt I had lost enough money before dinner, we went back to the Identity desk where they still hadn't located a host for me, but finally by phone they reached one and they ended up upgrading me without asking any questions or for the name of my host's at other casinos. We were suppose to meet Alaska in about 10 minutes in front of the Chandelier bar but just then she arrived at the player's card desk so we got to meet her lovely daughter who is just a year short of having her big 21st birthday in Vegas. Alaska's daughter left us to go shopping and meet up with other's in their family while the three of us headed off to the Chandelier bar. Above is Alaska and myself at a table between two of the bars within the Chandelier and it seemed to be a no man's land since we couldn't get a server's attention. We then moved to a table close to the larger bar and again waited for a server to notice us. It was a long wait. While there we studied the above menu. A server finally comes by and tells us the shift has changed for the menus and that one is no longer good and to look at this one. While we're looking at the new menu and wondering if we can order off the first one, we lose our server again. At this point we just give us on having a drink at the Chandelier bar and decide to go see what the free drinks at the casino are like. I do like the Chandelier bar though and I'm planning on actually getting a drink there in the future, and hoping by February I will have better luck with the service there. On our way to play and drink we stop for a photo op at one of the empty gaming blackjack cabana's. My gaming luck continued to be lousy at Cosmopolitan, but fortunately both Socalgirl and Alaska were doing quite well at their slots. The cocktail service and quality in the Cosmopolitan is excellent. I was quite happy with my chocolate martini and later their signature drink the Cosmopolitan. Normally I don't order the free drinks in most casinos with the exception of Wynn/Encore, Aria and Bellagio because the quality isn't very good in my opinion, so to drink two before dinner was unusual for me, but it did take away the sting of losing. While we were entering Cosmopolitan I had put on the eyeglasses that I need for distance so I wouldn't miss anything, even though I normally don't wear them in Vegas. After our great dinner I discovered that at some point from the Chandelier bar where I last remember wearing my glasses and the photo ops in the casino I had lost my new prescription eyeglasses. We said goodbye to Alaska who was off to rejoin her daughter and other family members, while Socalgirl and I back tracked to previous locations and checked in with the lost and found department to no avail. Returning to Palazzo my luck seemed to return when I had a decent hit on my favorite Wolf Run. While it was playing it's winning theme song a man standing near by struck up a conversation with me about it and it wasn't long before we discovered we were both members of the slot forum message board! Considering the crowds in Vegas that week, it's just amazing to me we had this accidental meeting. In case you are wondering who took the photo that was his beautiful blonde friend who he was waiting for to exit the ladies room when he noticed my win on Wolf Run. After Wolf Run I found out that Socalgirl had been even luckier then me at the slots but had to leave for home so we said goodnight and I continued to play a bit more and had a nice hit on Treasures of Troy. After that I found myself losing at Palazzo and walked over to Venetian. I discovered the new Star War's Droid Hunt Slot that evening at Venetian and had a lot of fun playing it. Bonuses were hitting quite a bit but not for high amounts, however they were fun. After Star War's, I tried Witches Riches, $5 Pinball and other slots at Venetian but nothing was hitting so I decided to walk back to Palazzo and call it a night. 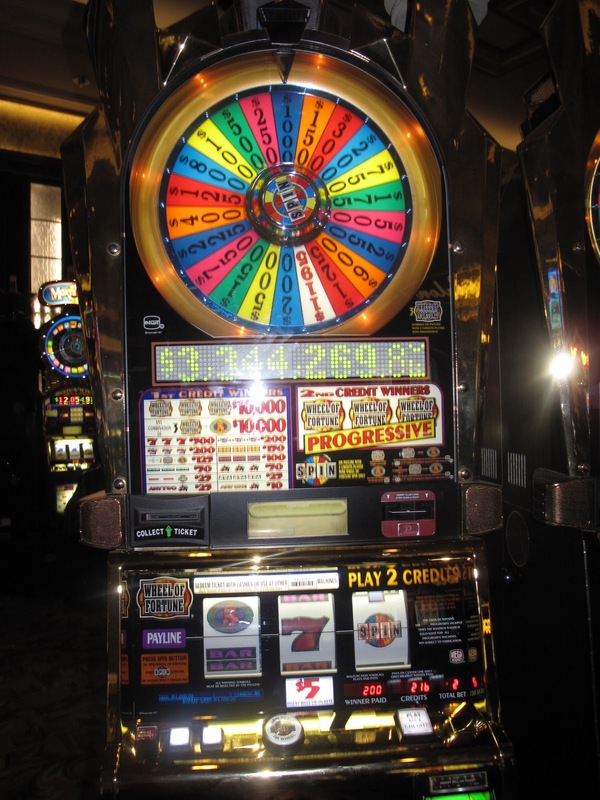 On the walk back to my room, I couldn't resist playing the $5, Wheel of Fortune at Palazzo and hit a spin for $750.00, so the evening ended on a high note despite the loss of my eyeglasses. Tuesday I woke up and called Cosmopolitan about my eyeglasses and they said no one had turned them in to lost and found. I then tried to update the blog but for whatever reason was having problems with the room's internet connection and gave it up. I had my brunch at Grand Lux and ordered the usual Manhattan chopped salad with shrimp. Having about a hour to kill before my two girlfriends Denise and Sharon arrived I went back to my lucky Star Wars machine which was still giving me bonuses. Unfortunately the first two bonuses paid me zero which was annoying as I'm one of those slot players that believe all bonuses should pay something. Finally on the third bonus I had a win for $81.00. I tried a few more slots at Venetian but was just losing so I walked over to meet my friends at Harrah's and it wasn't long before my girlfriends pulled up in a cab and we went up to check out their rooms. On the way to their rooms, I noticed that Harrah's had the new Star Wars slot and some lady had just hit a hand pay on it, so I guess the new slot can pay out nicely if one is on a lucky streak. We left Harrah's after they unpacked to visit the Venetian Gold Lounge so Sharon and Denise could get a snack to hold them over until dinner. 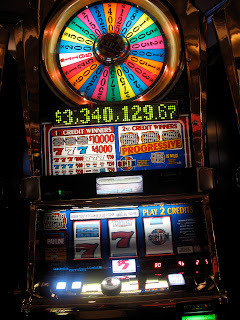 After that we went to Palazzo to get Sharon a player's club card and on the way there, I stopped at the $5, Wheel of Fortune with them and on the 1st push hit a spin which gave me $500.00. I'm now looking at my friends with new appreciation wondering if they are my lucky charm. Turns out they weren't my lucky charm. That was the end of my luck as during the hour we spent playing at Palazzo I lost on everything I tried. Sharon and Denise wanted to have dinner at Society Cafe that night so we walked over to Wynn and Encore where I continued to lose. 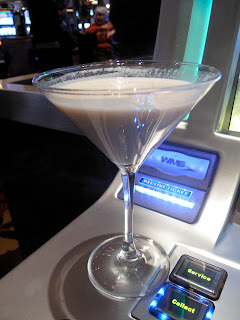 I tried my lucky Witches Riches from last trip at Encore while having a chocolate martini, but it didn't want to give me a hit or bonus, however the man sitting next to me playing Cleopatra II hit a hand pay on it while I was there, so the slots were paying off for some. After losing at a few more of the Encore slots like Goldfish and the original Wizard of Oz, we go in to dinner at Society Cafe. Service was excellent and we had a wonderful waiter with a great sense of humor. Sharon and Denise both ordered the roast tomato bisque and ate it with the pretzel bread. I had a shrimp cocktail which was good and their caramelized sea scallops with pancetta and cauliflower puree. Lighting at our table was very dim and I couldn't take very good photos. After dinner we went by the Wynn box office where Sharon and Denise bought tickets for Sinatra, Dance with Me, that I had already seen. 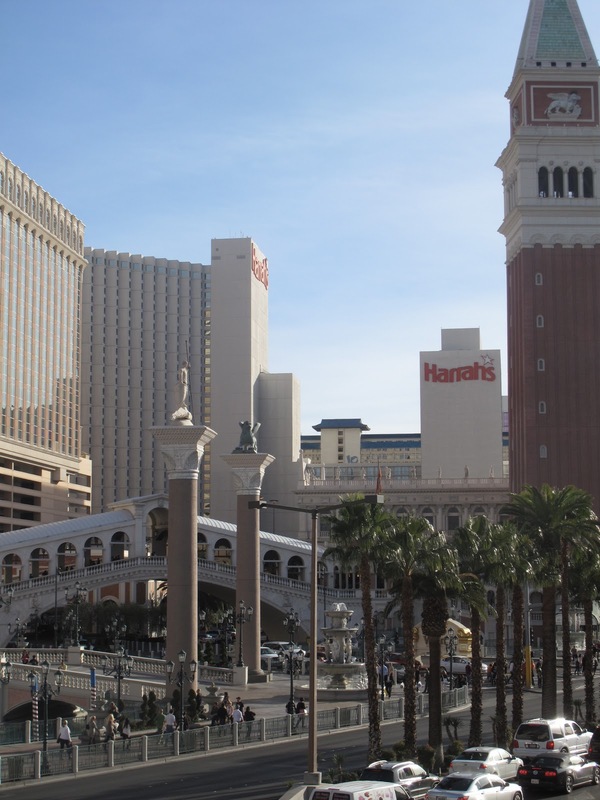 We then walked back to Venetian and took a brief walk by the shops and gondola area on the second floor and then my friends returned to Harrah's. I stayed at Venetian and went back to Star Wars Droid Hunt and had quite a few bonuses again. 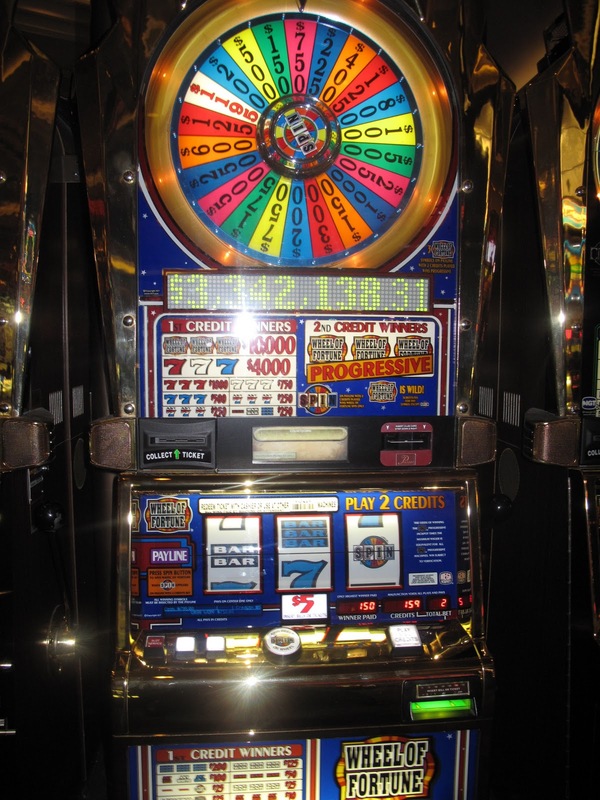 My gambling was all over the place that evening, I had some very nice hits on various slots but was losing on other's like $5, Pinball which no matter how many times I tried it this trip I never could get it to hit the Pinball. 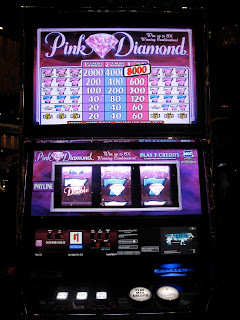 I walked back over to Palazzo and had a happy surprise when I hit the spin for $1000.00. This made me about even for the trip, not ahead, that's how much I had been losing earlier at Encore and between wins at Venetian. 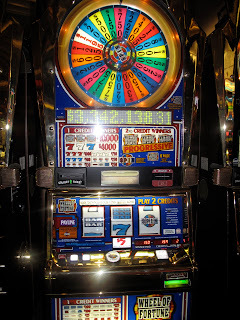 I then hit another spin on a different $5, Wheel of Fortune for $200.00. Above is the video of that spin. After the high of winning the $1000, I went back to losing on WOZ Ruby Slippers, the original Wizard of Oz, Goldfish, and the list goes on, think of a slot, pick any slot and I was losing on it. I decided to take a turn on Cleopatra II being inspired by the earlier hand pay at Encore I had witnessed and then hit a bonus which is very rare for me. I had some brief excitement when the bonus re-triggered but at that point it fizzled and while a hit of $400.00 is good, I was expecting a bit more. After Cleopatra II, I tried Wolf Run, and a few other's but my luck was not swinging back to winning so I took a few photos of the Palazzo fountain area that was decorated for Chinese New Year's and went to bed. I slept in on Wednesday and then met with Denise at Venetian's Grand Lux restaurant for lunch. Denise ordered a chopped salad and the chicken pasta with sun dried tomatoes. She really liked both the salad and pasta but the portions are so large she couldn't finish either dish. Sharon was meeting a girlfriend on lives in Las Vegas for lunch and would meet Denise later for dinner and to go see Sinatra, Dance With Me at Encore. I had plans that evening to join Socalgirl and eat dinner at Stripsteak at Mandalay Bay. Above is the Sonoma lunch size salad that I ordered that had grilled chicken, avocado, bacon, dates, raisins, goat cheese, corn and glazed walnuts. The dressing was a hazelnut mustard vinaigrette. I enjoyed it so much, I ordered it again on Thursday and Friday! After lunch Denise and I walked around a bit looking at the stores and decorations but she was getting calls and texts from home and needed to go back to her room and sort things out before she met with Sharon, so I walked to Harrah's with Denise and decided to give them a bit of play since I had the comped room for Sharon there. In the last five years I have never won more then $20 at a time playing at max bet on the slots in a CET casino and my record stays intact. I had played and lost while Denise and Sharon were unpacking on the day they arrived and regardless of what I tried there today, Goldfish, Lord of the Rings, Cleopatra, I lost. I walked back to Palazzo and started out my day there with a win on Cleopatra II which gave me hopes this might be the day I would get ahead at Venetian and Palazzo instead of breaking even. From Cleopatra II I went on to play some VP with little luck and then lost on some other slots until I went to my favorite Wolf Run at Palazzo and had a few hits for around $100 and then a bonus that re-triggered for $178.50. Found a slot called Russian Treasures that I never had played before though it looked to be a older slot and had some fun on it. The sound track it played was the Beatles, "Back in the U.S.S.R". After Russian Treasures I played Treasures of Troy and once again hit a bonus that re-triggered twice but only paid $206.50. At this time Socalgirl arrived and I met her in the Palazzo parking area and we were off to Mandalay Bay. Once at MB, I went to the players card desk to get my new M-Life Platinum card. While it's nice I suppose to be at the highest public card level of M-Life, it doesn't seem to come with anymore perks then gold level, hopefully they will improve that card level soon. Socalgirl and I played for about 45 minutes at MB before our dinner and while Socalgirl did well, I managed to lose at the American Idol community slot, Wolf Run, Kitty Glitter and the $5, Wheel of Fortune before deciding to give up. Upon entering Strip Steak I wasn't impressed by their ambiance, as they didn't seem to have any. It was a large noisy room. Not liking the first table they tried to seat us at which was about 1 inch from 2 other tables they did give us better seating at one end of the restaurant. We were immediately served with their speciality french fries which are served with 3 sauces and cooked in duck fat. We tried each type of sauce and french fry but for both of us they had a funny after taste we didn't enjoy, so we ended up not eating them though we love french fries! Not enjoying the friend fries was a big surprise to me as other reviews just rave about how good they are, so it's likely the fries are delicious or not depending on your personal tastes. Service at Strip Steak was excellent, and I did enjoy the Raspberry Blues Martini that our server recommended. My starter was a shrimp cocktail which had a nice presentation and the shrimp were fresh and tasty. My entree was salmon and while it was fine, there was nothing special about it. Socalgirl ordered a baked potato with her steak, but it wasn't even hot enough to melt the butter. The asparagus side I ordered was okay but the sauce didn't thrill. Socalgirl's filet was a reasonably good piece of meat but had been overcooked. Our overall impression of Strip Steak is we've had better at Cut, Carnevino and SW steakhouse and won't be returning. It's not a bad meal it's just not good enough considering the competition of other Las Vegas steak houses. Deciding that dessert at Strip Steak was also likely to disappoint we left there and returned to Palazzo where we went to Cut and they were nice enough to seat us at a table in their lounge area and serve us one of our favorite desserts, their Chocolate Souffle! There's a short video in the video clips section of this blog that shows the presentation they do with the chocolate souffles. Socalgirl stayed for a while at Palazzo playing some Crazy for Poker while I continued my losing streak. After she left and we had said our goodbyes as I wouldn't see her for the remainder of this trip, I finally had a brief run of luck again with Star War's Droid Hunt, when the force and the empire went to battle and gave me a bunch of wilds for $348.00. After that I decided I was down enough for the day and would go to sleep. 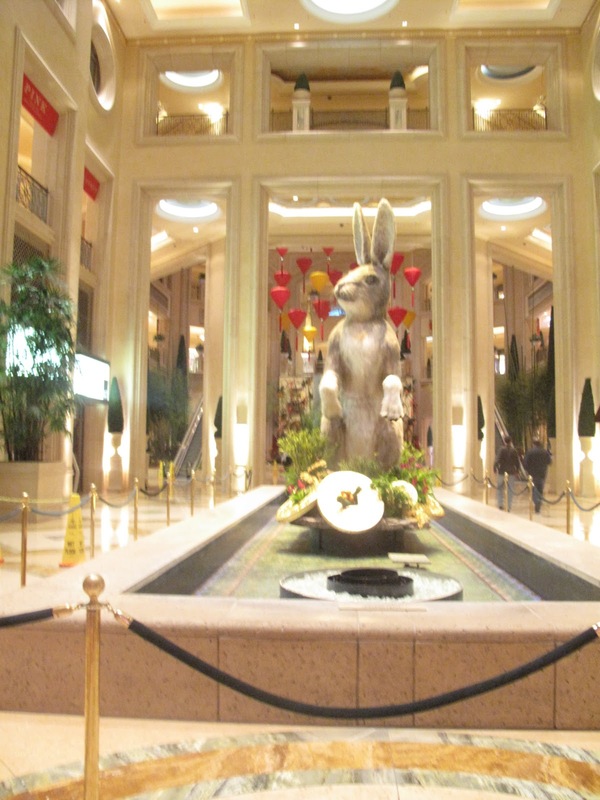 Thursday, I met Sharon and Denise once again at Grand Lux for brunch where we ate lightly as we had a 5pm reservation at Todd English's Olives restaurant at Bellagio. I also took them by the Palazzo fountains where they were getting ready to have the opening ceremony of their Year of the Rabbit Chinese New Year's display. The rabbit is electronic and it moved it's eyes, paws and tail. There's a short video of it in the video clip section of this blog. Before going over to Bellagio the three of us tried our luck at Palazzo and I was continuing my losing streak until I hit for $484.00 during a Wolf Run Bonus. The Wolf Run Bonus ended up being a total of $531.50 and put me in a positive mood for the afternoon. Later when Wolf Run had cooled off I went to Goldfish which is near the Palazzo player's card desk. 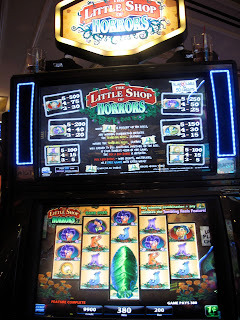 The Goldfish machines there used to give some great payoffs at times, last year we won over $900 during a bonus where the free spins are multiplied because we hit the fish can bonus within it, did well on that for $90.00 and then it hit the X10 multiplayer. While we keep hoping to repeat that success usually the most we get when lucky is around $100 and in this case when I had the redfish bonus, the fish kissed the bonus up to $128.00. Denise and Sharon were not having any luck at Palazzo, though the day before Denise had briefly played the slots at Harrah's and hit a bonus on the Fire Horse slot that had paid her over $500.00 on a $2.00 bet so she was up for the trip. The weather was great during our trip and both Sharon and I love to walk but Denise's ankles and feet were swelling up, so we grabbed a taxi to Bellagio. 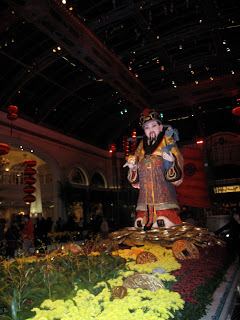 We walked in to Bellagio and went directly to the conservatory's Chinese New Year display which was lovely. After the conservatory we went to the Bellagio VIP lounge which was the busiest I have ever seen it, but we found some comfortable seating on a couch and were served some Cabernet Sauvignon that all of us enjoyed. After our wine it was 4:45pm and time to go stand in line at Olives so we could be sure to get a table on their patio. When we arrived I was surprised to already find a line so while we ended up with a patio table it wasn't along the rail but more in the back. After dinner our server took a couple photos of us near the railing. Sharon is in the center, and Denise is on the right. Dinner at Olives was good. Below is the crab beignets I ordered and they were delicious. I also had the rib eye steak again but didn't bother to take a photo as it's featured in my October trip report. Sharon had the spring pea ravioli at Olives and said it was wonderful. Denise ordered the brick chicken which I have photos of in my October trip report. I didn't order dessert but Sharon and Denise shared a Banana Tiramisu. I didn't taste it because I'm not that fond of banana desserts, and neither Sharon or Denise ended up caring for it much, finding it too dense. In the past I've ordered different desserts at Olives and thought they were fabulous so I think this was just a unfortunate choice on their part and possibly the restaurant's in putting it on the menu. Sharon and Denise both wanted to see Cosmopolitan so we tried taking the tram to Crystals and walking to it from there. It was a longer walk then expected and pretty much did Denise in with her leg problems. 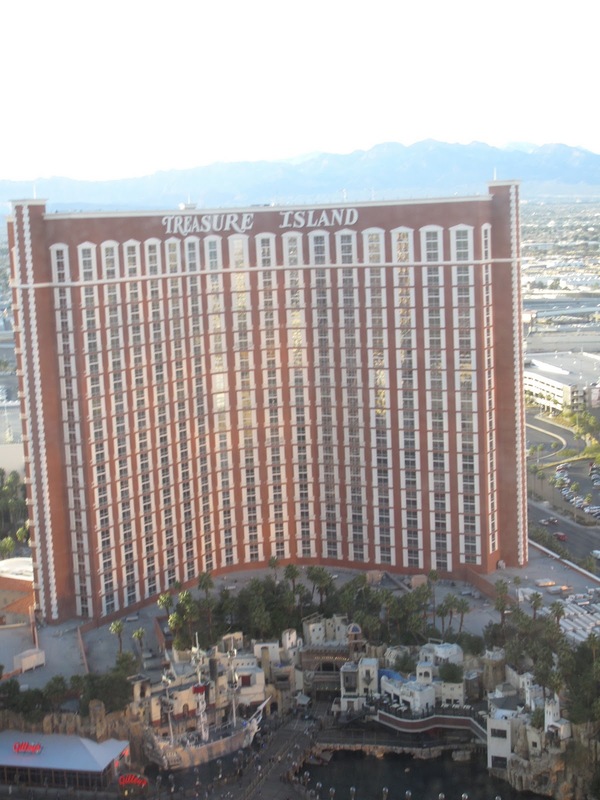 Due to the leg problems and the fact Denise's husband was arriving around 11pm that evening to join her in Vegas for a couple nights, Denise left Sharon and I at Cosmo and cabbed it back to Harrah's alone. Walking around the Cosmo casino I noticed Dragon's Realm which I hadn't played before so I started playing it. Sharon was next to me playing another slot that I can't recall. Cocktail service is good at Cosmo so it wasn't long before I had one of their delicious chocolate martini's in front of me and Sharon had their signature Cosmopolitan. Sharon and I played a variety of slots at Cosmo for about 90 minutes and we both ended up breaking even. 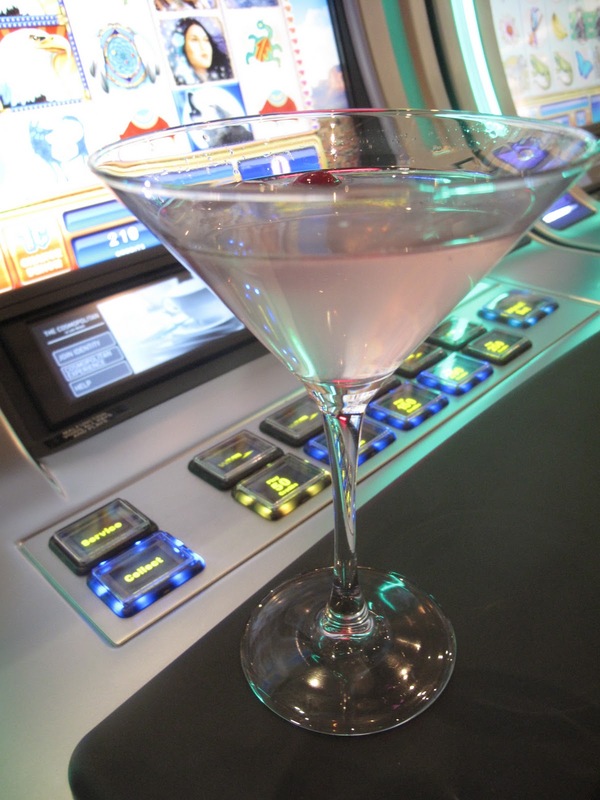 For me breaking even at Cosmo after my Monday losses of more then $500.00 seemed like a win, (almost). Before I left Cosmopolitan I found one of the few reel slot machines I like Pink Diamond which decided to give me a small hit. We cabbed it back to Venetian where Sharon returned to Harrah's after joining me for a soft drink at the Gold Lounge. 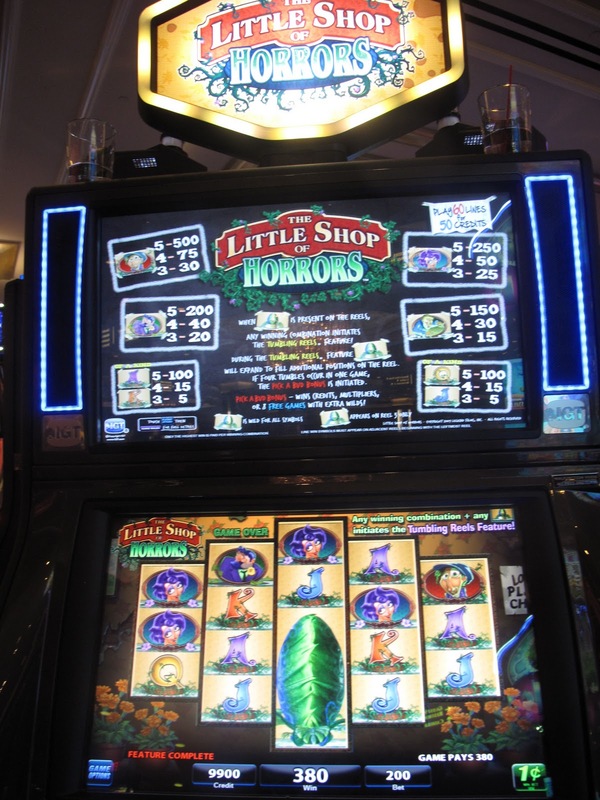 I returned to losing on everything the rest of the evening, nothing was hitting for me much after that though I had some fun on a new slot I found called Little Shop of Horrors. 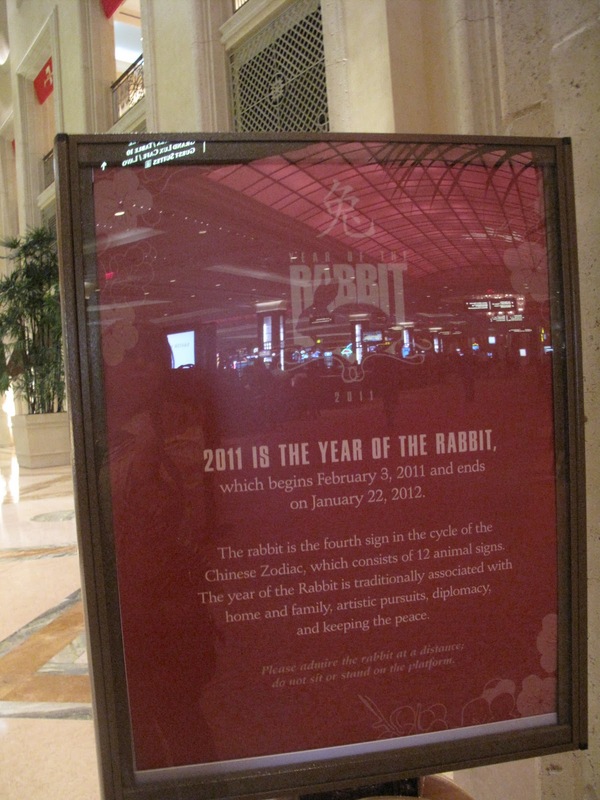 This slot was at Cosmopolitan and Palazzo. Short video of the Little Shop of Horrors. It's getting late and even though I had some good wins this trip I was down half my bankroll. Before I went to bed I had a decent hit on Lord of the Rings which up until now was fun but wasn't paying anything. I woke up Friday to the phone ringing at 10am and one of my friends was calling to tell me that some of our mutual friends had called her to let her know that a scammer was on my Facebook account as the hacker was talking to my friends who were currently online in chat on Facebook and telling them I was in London and had been held up at gunpoint with my whole family and needed them to send me money. What a mess! None of those contacted on my friends list believed it or sent money, though some of the tech people I used to work with and that my husband still works with had fun baiting the hacker and asking him/her lots of questions about past computer games we had worked on, none of which the hacker knew the answer too. I got online, changed my password and then put up a status message letting everyone know what they already knew that I wasn't in London needing money. Unfortunately for my Facebook account a couple friends reported the account as being hacked and 8 hours later Facebook disabled it and sends out a form letter to me with questions to answer. Even though I answered immediately and have sent out various emails to Facebook every few days, to this date I have never received a reply from Facebook customer service nor has the account been enabled. It seems impossible to reach anyone at Facebook and they are setting a new low for what is called customer service, even for what is basically a free service. How did my account get hacked since I have a very random password and is not one I use for email or other online activities? It got hacked while my Mac was connected to the Hotel wireless network. Beware the hotel, airport, coffee shop, etc...wireless networks which are not usually secure and since some services like Facebook run in the background it's easy for hackers to take over your account with a little program that I won't mention here. How do I know about that hacking software? Ironically our local 11pm news did a story on this 6 days after I was hacked about how unsecured our computers are when using wireless public networks even if said networks require a password. They did demos in the news story by showing customers at a coffee shop how they could take over their Facebook account using said software when those customers were connected and doing their business outside their home or office firewall. Facebook woes aside it didn't set a good tone for my last day in Vegas. I met Denise, Dana (Denise's husband), and Sharon once again at Grand Lux where we pretty much ordered the salads we had been enjoying previously with the exception that Dana ordered a pork sandwich. Denise and Dana's trip was taking a temporary turn for the worse too because their son had just called and one of their puppies had eaten part of a throw rug and was very sick. I'm happy to report that the puppy has made a full recovery and is likely eyeing other objects in their house he might eat. Sharon and I split up with Denise and Dana since they were going downtown to sightsee later, and we ended up walking across the street and window shopping at Fashion Mall and then over to Treasure Island, taking the tram to Mirage and then walking back to Palazzo. Sharon had checked out of Harrah's and dropped off her luggage at my room since my host had given me a late check out of 5pm. While I had half my bankroll left, it didn't seem like a lucky day to gamble, so except for a brief encounter while walking through Mirage with the Slotski slot betting 40 cents a push, I didn't. Sharon and I had a safe and easy flight home on Southwest where we found our husband's waiting to pick us up. While I always have a good time in Las Vegas, this trip it certainly had its share of annoyances with losing my eyeglasses at Cosmopolitan and then the Facebook account hack. I'm looking forward to returning to Las Vegas on February 10th for 5 nights with my husband where we will be staying the first few nights at Palazzo and then the last 2 nights at a wrap around terrace suite at Cosmopolitan. There's going to be a big Meet while we are there with one of the private Vegas message boards I'm a member of so I'm expecting some interesting experiences. Great report, really enjoyed it. That stinks on the facebook hack, although I'm now curious what were some of the games you've worked on previously? understood, I was fairly involved from a user level all the way back to compuserve and such, so I was just curious.